Set in the heart of the Portes du Soleil ski area, Avoriaz is a high altitude resort popular with families and groups alike. La Folie Douce Avoriaz is being built in the place of Chalet L’Envers, next to Le Yeti. The bar will have a self-service La Petite Cuisine restaurant open from 11.30am to 3pm as well as the fancy La Fruitière restaurant – which will be open for both lunch and dinner. The bar has a huge new terrace and will host daily après parties from 2pm to 6pm, with DJs, singers and performers. Avoriaz already ranks among Europe’s best freestyle ski resorts, and the addition of the Folie Douce will boost its après ski credentials hugely. In addition to the brand new Avoriaz property, La Folie Douce is opening its first ever hotel in Chamonix! Home to the mighty Mont Blanc – one of the world’s most famous peaks – Chamonix is a year-round resort with snow sports in winter plus hiking, biking and more in summer. Their flagship hotel is being built in the historical palace of Le Savoy and will have 250 rooms. There will be both 3 star ‘access’ rooms sleeping 2,4 or 6 people, and 4-star ‘premium’ space rooms with luxury services sleeping 1-4 people. La Folie Douce Hotel Chamonix sits in an unbeatable ski in/ski out location next to the Savoy drag lift providing access to the main Plan Praz lift and to the Brévent and Flégère ski areas. The hotel also hopes to provide a bus service to whisk guests to the other ski areas in the valley. Guests will choose from three restaurants, all offering something different. La Petite Cuisine will serve a variety of alpine, Savoyard and Italian cuisine. La Fruitière – their signature restaurant – will offer a traditional gourmet menu, and Le Kiosque will serve street style food in a more casual setting. As well as the three restaurants, the hotel will of course have the famous on-mountain après bar hosting daily après ski parties from 5pm-8pm. 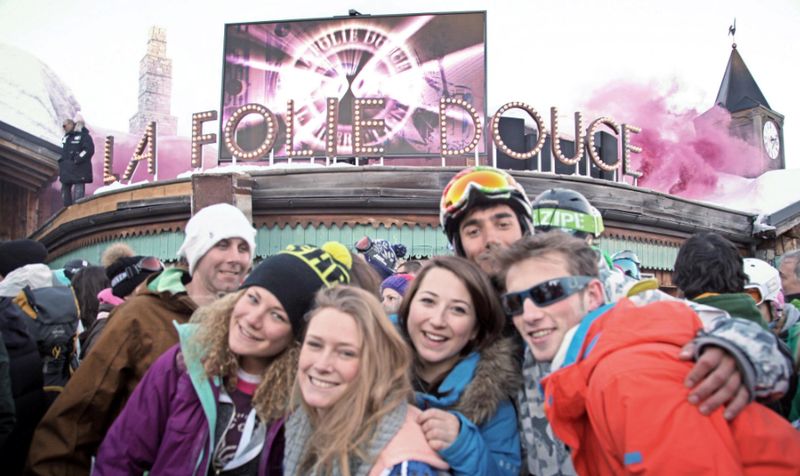 Folie Douce describes the party as something between cabaret and street theatre! There will also be a cocktail bar which will offer a good alternative to the après party and is perfect for those looking for a slightly ‘quieter’ drink. Along with the restaurants and bars, the hotel will boast fantastic facilities including kids’ clubs, video games room, ski hire shop and spa with outdoor swimming pool, sauna and steam room. With the hopeful success of the first hotel in Chamonix, La Folie Douce plans to continue to expand to other resorts with the next hotel being built from scratch in Serre Chevalier in 2021. There are also rumours of hotels in other locations including La Plagne and Verbier, so watch this space to see where La Folie Douce pops up next! If you’d like more information on the Folie Douce experience, or you’re keen to know more about the resorts mentioned in this blog, you can call us on 0203 0800 200 or get in touch via our online chat facility.